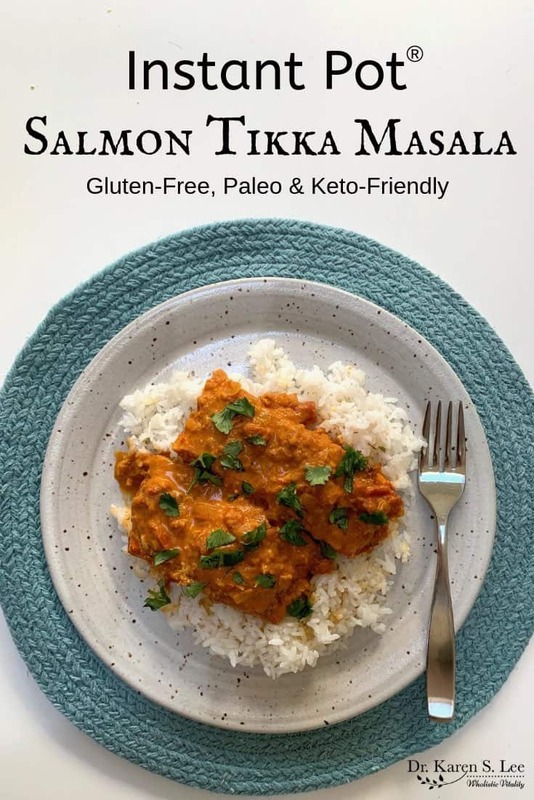 Instant Pot Salmon Tikka Masala takes about 30 minutes to cook on a busy night and it has rich flavors with nutritious Omega-3 fatty acid. It’s a great way to add more fish to your meals! My family loves LOVES Indian food. We often go to our favorite Indian restaurant which happens to be in our town but we also order in on weekends too. We even have their phone number on speed-dial and whenever we call to order, the manager answers, “Hi Dr. Lee! How are you?” Well, recently, he started answering, “Hi Andrew! The usual?” since my son started ordering too! True story. We love the rich and aromatic flavors of Indian cuisine so much that I started experimenting with a few recipes and included some of our favorites in “Keto Cooking with your Instant Pot” We still order takeout from our beloved Indian restaurant occasionally, but I make it at home most of the time with the authentic spices I buy from a local Indian market. When you think of Indian food, you might think of hundreds of spices simmering for hours and hours to get the authentic flavors. But what if I told you that it’s not the case when you use the Instant Pot to reduce the cooking time to almost NO TIME at all? And that Archana makes it so much easier with her modern recipes that use fewer ingredients while keeping authentic flavors intact? This cookbook does exactly that. 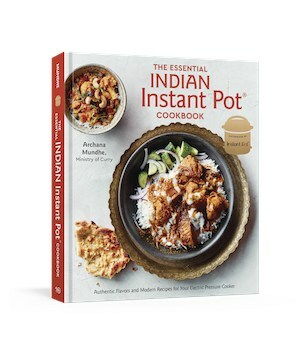 The classic dishes such as Butter Chicken, Spicy Lamb Vindaloo, Curried Coconut Shrimp, Salmon Tikka Masala, and vegetarian and lentils recipes that are modern, quick and delicious are in this cookbook and it has all-time favorites in simplified versions for the Instant Pot. 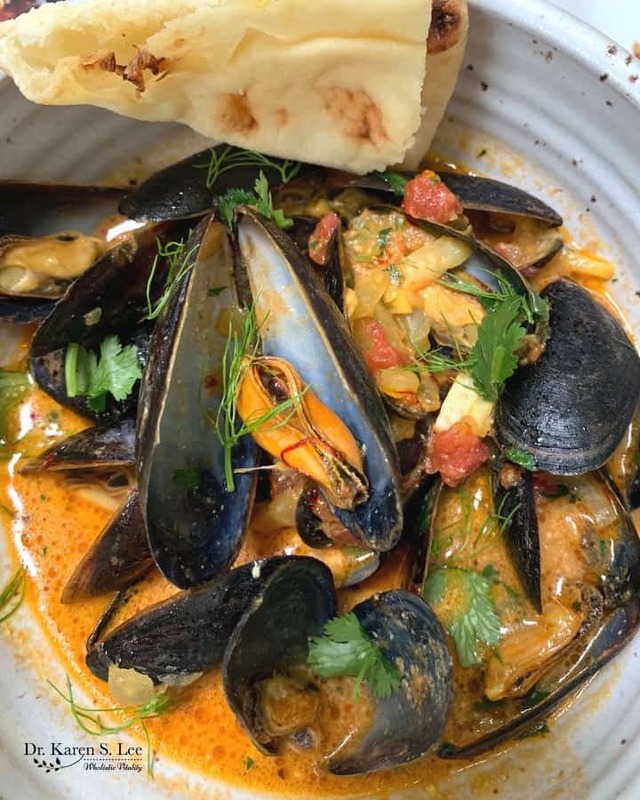 I made Fennel-and-Saffron-Spiced Mussels and my daughter and I devoured it with naan bread even before the boys came home from work. 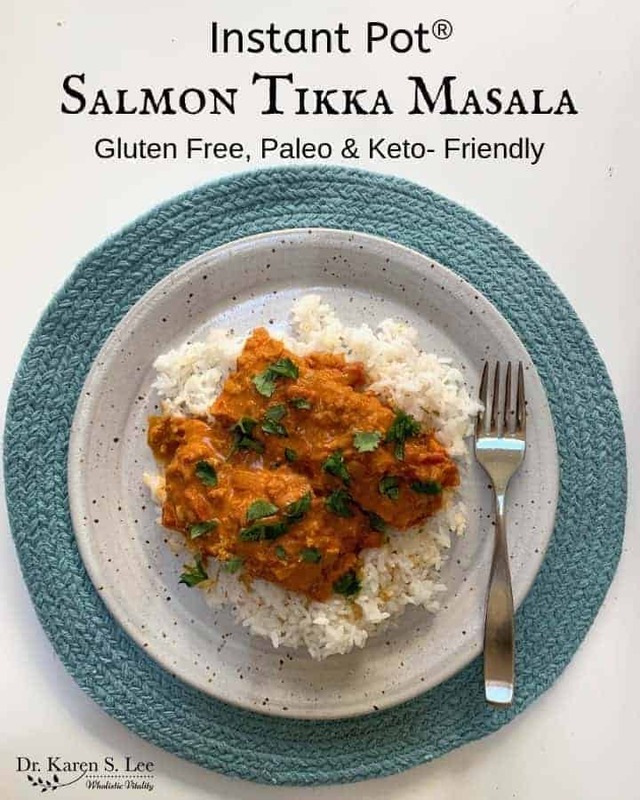 But I did make this yummy Salmon Tikka Masala – of course, I Paleotized it – and my family just loved it! What a refreshing way to eat salmon! Seriously, who would have thunk to use salmon with tikka masala sauce? If you want 75 authentic Indian recipes PLUS Indian spices primer, and how to use the Instant Pot with timetables, buy this hardcover beautifully photographed cookbook. Note: To make this recipe Paleo friendly, use coconut cream instead of heavy cream. And to make it keto-friendly, use cauli rice instead of white rice. Use paleo friendly or keto friendly bread of your choice to sop up the sauce. You won’t want to waste any sauce! Trust me. The recipe below is a long one because Archana gives us the recipe for Garam Masala too! But if you don’t want to make it, you can easily find it at Whole Foods or any spice markets or Amazon. Links are in the recipe. And please, if you make this recipe, come back and rate it so others will know how delicious it is! Select the high Sauté setting and heat the oil. Add the onion and salt and sauté until the onion turns translucent about 5 minutes. Cover the pot with a glass lid (or another non-locking lid that fits) to speed up the process. Add the ginger and garlic and sauté until aromatic, about 1 minute. Add the tomato puree, chili powder, turmeric, and garam masala. Press the Cancel button to turn off the Instant Pot. Pour in the water and stir well with a wooden spoon, nudging loose any browned bits from the pot bottom. Perform a quick release by moving the Pressure Release to Venting. Press the Cancel button to turn off the Instant Pot. Open the pot and, wearing heat-resistant mitts, remove the bowl of salmon to a trivet and remove the rack. Stir the heavy cream (or Coconut Cream for Paleo) into the curry, then crush the fenugreek leaves with the palms of your hands to release the aromas and stir them in as well. Select the high Sauté setting and carefully add the salmon to the curry, turning it to evenly coat. Cook until the curry comes to a gentle boil and is heated through 2 to 3 minutes. Press the Cancel button to turn off the Instant Pot. Spoon the curry onto plates and serve the rice or Cauli Rice for Keto, and lemon wedges alongside. To make this recipe Keto-Friendly - instead of white rice, use cauli-rice.